As the federal government’s plans to sell Plum Island chug along in snail-paced time, the East End’s county legislators, town supervisors and village mayors are asking New York State to intervene. The East End Supervisors and Mayors Association sent a letter to New York Governor Andrew Cuomo April 26 asking the state to declare the sale inconsistent with the state’s Coastal Zone Management Act, which sets policies to protect natural and historic resources and shores up the state’s mission to provide public access in coastal waters and along shorelines surrounding the state. Advocates are asking the governor’s office to make clear to the federal government that the sale of the island is not consistent with the state’s coastal policies, before the federal agencies charged with the sale issue a consistency determination, which could include language stating the sale is consistent with state policies, without the state’s input. The state’s Department of State, headed by the governor, administers the state’s coastal management policies. The East End Supervisors and Mayors Association includes the supervisors of the five East End towns and 10 incorporated villages. The Supervisors and Mayors Association also sent letters to U.S. Senators Charles Schumer and Kirsten Gillibrand, and Congressman Lee Zeldin suggesting keeping the existing laboratory and associated infrastructure that covers 20 percent of Plum Island as a research facility and preserving the remainder of the island, zoned a conservation district by Southold Town, as a wildlife refuge to be managed by the U.S. Fish and Wildlife Service. On April 27, Mr. Zeldin re-introduced legislation in the House of Representatives that would suspend the congressional mandate to sell the island to the highest bidder. Efforts to suspend that mandate date back to former Congressman Tim Bishop’s original introduction of a similar legislation in 2013. New York senators have not yet taken up the cause in the U.S. Senate. 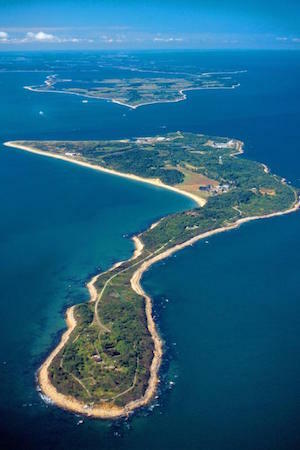 The state has 13 coastal policies that apply specifically to the Long Island Sound region, where Plum Island is located, five of which Plum Island preservation advocates believe apply directly to Plum Island.